Chicken Rice is one of the wellknown dish in Singapore. It is sold in almost all of the food courts in Singapore. I remember, with only S$ 2.50 I can buy a plate of chicken rice set in my school canteen. But this dish may cost more in other proper chicken rice Restaurant. I admit that I didn't eat chicken rice often in Singapore. This is not my favourite dish, mostly because it can be found everywhere. But few days ago, I saw a blog of a friend posting about chicken rice and since then I am challenged to make one here. This is not a authentic way to make a real chicken rice, but at least this can remind of my time in Singapore. I try to combine recipes from internet with the limited ingredients and tools in my kitchen. 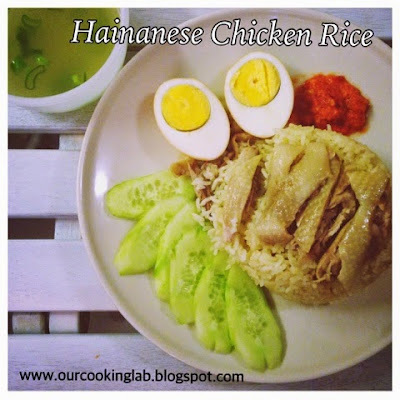 Dedicated for friends who have leave Singapore for a some time or for good and want to make their own home made chicken rice. I don't know how the best chicken rice supposed to taste, but here I present you my first ever try of making chicken rice (white) complete with its garlic sauce, soup and eggs. Put spring onion, ginger, garlic, onion, coriander powder, and water in a big pot and brig to rolling boil. Put chicken legs in the boiling water. Make sure the water is enough to cover all of the chicken parts. Cover the pot and boil for 5 minutes. Once the chicken throughly cooked, take out all of the chicken legs from the pot and rinse them with running water or iced water bath. Deboned the chicken legs and set the meat aside. Brush the sesame oil on the chicken and set the meat aside. Keep the remaining chicken bones for making chicken stock. Add chicken bones to the earlier pot and boil it for around 20 minutes. Drain off the stock and set aside. Wash rice, and strain it. Set aside. Add vegetable oil on the heated pan. Add shallot, garlic, and ginger. Saute until fragrant. Add the earlier strained rice and salt, and stir until fragrant. Mashed chili, garlic, and ginger with mortar and pestle, or simply blend it with food processor until they reach a paste consistency. Add in chicken stock, lime juice, sugar, and salt. Peeled hard boiled eggs and dip it in a mixture of water and soya souce. Put in a small water tight container. Leave them for a while. Turn the container upside down each 5 minutes just to get the color of egg evenly brown. Add salt, white pepper and sliced spring onion. Combine every element except soup in one plate and add sliced cucumber as garnish. Serve it with hot chicken stock soup. The amount of garlic chili sauce is too much for 6 person portion. It is still not perfect for me, but I'm not sure how to improve it. Maybe the garlic or ginger was too strong, or I just need to try another recipe for garlich chili sauce. Next try: etter chicken deboning skill for better presentation. More improvements needed for the eggs. Maybe new recipe. This time I just use the easiest one.